Sachin Tendulkar breaks the World Record. 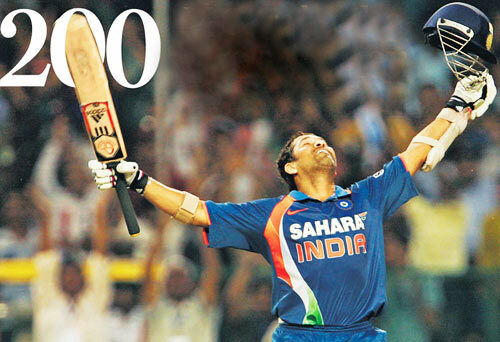 Sachin Tendulkar hits the first ever ODI double century. A record made for which we have waited for more than a decade! Sachin Tendulkar is an Indian cricketer widely regarded as one of the greatest batsmen in the history of cricket.Salute the man. Proud to be an Indian just by seeing him bat like this. Tendulkar achieved the unique landmark when he run a single off Langeveldt against South Africa in the second one-dayer of the ongoing three-match series.Sachin’s 200 came off 147 balls, which include 25 fours and 3 sixes.The master surpassed the previous highest individual score made by Pakistan’s Saeed Anwar (194 against India in 1997) and Charles Coventry of Zimbabwe (194 not out against Bangladesh in 2009). He is the leading run-scorer and century maker in Test and One Day International cricket. Next: Paypal Resuming Local Bank Withdrawals to India from March 3rd.